Buying new furniture is expensive and a hassle. It’s far easier to preserve and revive your current furniture instead. Many people rush to dispose of their sofas and upholstery chairs as they falsely believe they are damaged/worn-out beyond repair. Truthfully, couches do get dirty pretty quickly. People tend to lie on them barefoot, munching a packet of crisps, while binge-watching their favorite show. All to soon the couch is littered with crumbs and oil, giving the couch a distinctly oily look. Prep Your Couch: The first step is always to prepare the couch for a deep clean. 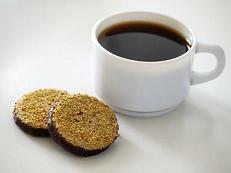 This involves vacuuming down the sides for any crumbs and loose dirt. For this step, you can use a stiff brush or a mini-hoover. Also, wipe down the wooden frame with a wipe or damp cloth. Deep Clean: Now’s the time to properly clean your furniture. Which method you use depends on the fabric of your couch. We use steam cleaning, dry cleaning, shampoo cleaning, and deep cleaning methods. 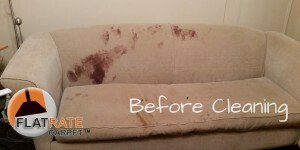 Target Stains: Some stains are so deeply embedded in the couch fabric, a regular cleaning method is not sufficient. Instead, you need to target these stains with couch cleaner solutions. 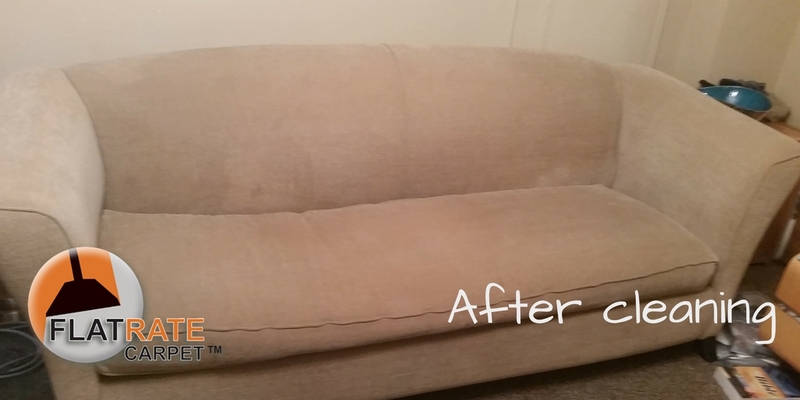 The best way to clean a fabric sofa is to use a vinegar based solution. Soak a cloth in the solution and scrub the stain are until all discoloring has been removed. Use a second cloth to apply clean water and remove the soap. For leather upholstery, use an olive oil and vinegar based solution. You can make this yourself or buy a ready-made leather furniture cleaning spray. For synthetic couches, it’s possible to use regular dish soap to spot-target and remove troublesome stains. Sometimes it’s easier to just keep your furniture clean in the first place. There a few common sense tips that will help you achieve this. Avoid sunlight: Too much heat can affect your sofa’s durability. Position your couch so it’s not receiving direct sunlight all day. Keep the room ventilated: Cooking odors and steam can speed up furniture wear and tear. Keep a window open, especially while cooking. Sometimes, even your best efforts won’t be good enough. Some couches are so well-worn that a DIY job simply won’t cut it and you need to call in the experts, (it’s still a fraction of the cost of buying a new couch). 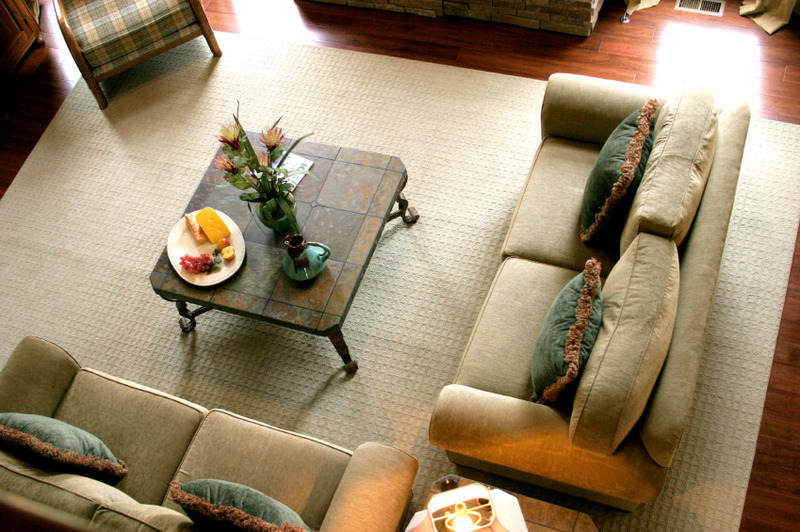 At Flat Rate Carpet, we pride ourselves on our ability to bring back old sofas from the dead. Here is a worn-out sofa in New Jersey which we made look as good as new using our tried and trusted methods. This sofa was so tattered and worn that the owner was about to throw it in the dump. Luckily, we persuaded him otherwise and needless to say, he was pleased with the results. People don’t tend to think about cleaning blood from our sofas until they face this scene. It usually comes as a side-effect of another stressful situation: an accident at home, a medical condition (nosebleeds are very common among children) or a female dog in heat. With more important things on your mind, it’s quite common to start cleaning after the blood is absorbed and you’re facing an ugly stain. Why Should I Call a Professional? While blood type does not affect stain removal methods, it is crucial to know how your cleaning method impacts the type of your upholstery. A common cleaning agent may work perfectly with some fabrics and turn out to be destructive for other upholstery materials. This is why when doing-it-yourself you must check your detergent on a hidden spot. 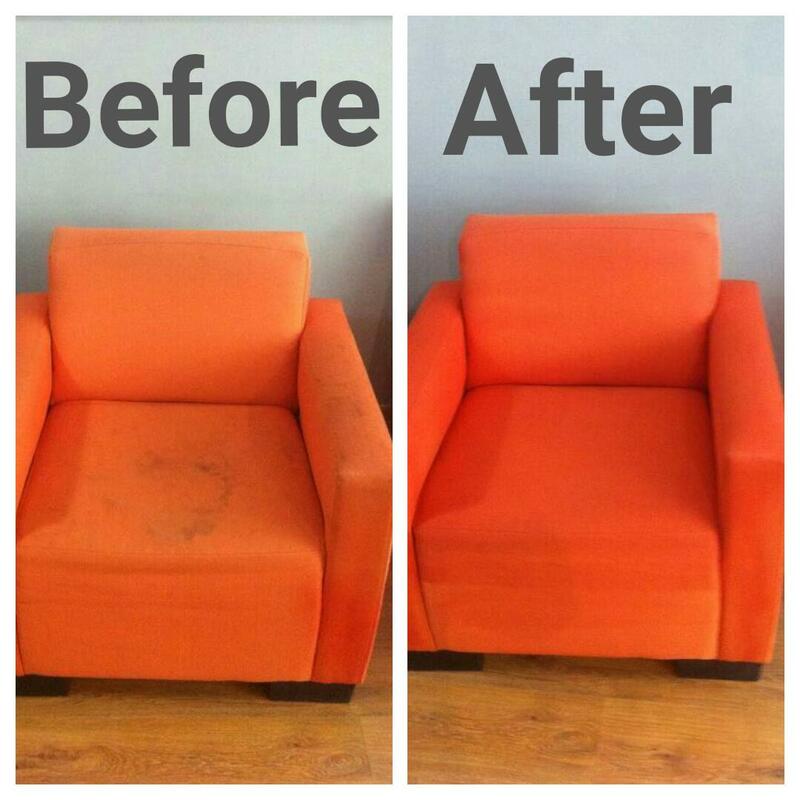 With more than 18 years cleaning upholstery, we have the capabilities to beat every spot and stain around. With blood stains, our cleaning method in hot water extraction. 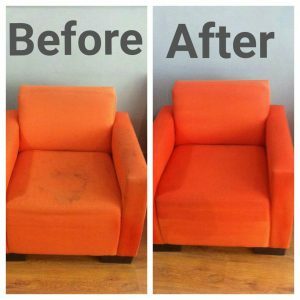 Our professional-grade heavy-duty machines are accurate and powerful, and our technician are seasoned enough to eliminate blood spots and stains without damaging your upholstery. It is important to keep in mind that household cleaning agents are chemicals nonetheless. Some of them are as strong as professional grade detergents. Do not use a cleaning solution if you don’t know its effects on your and your family’s health. Don’t mix cleaning agents, as they might not react well with one another. When in doubt, call a professional. Health issues aside, another downside of using chemicals for cleaning your home is the damage to the environment. Chemicals that go down the drain are a major polluter. This is why we only use non-toxic, biodegradable cleaning materials, assuring that both your family and our planet are safe and healthy. Look at this sofa we cleaned at an apartment at the Upper West Side and judge for yourself. Fully bonded and insured, we give you a 100% satisfaction guaranteed on all our work. Contact us now and a technician will arrive at your home for a free, no-obligation estimate. We are a phone call away. Call us at (866) 466-4576 or contact us using this form and we’ll find the best time for you – as soon as today! Finding gum, candy and other sticky substances on your sofa doesn’t mean that your furniture is ruined. 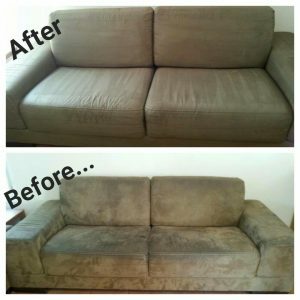 Knowing the right way to remove sticky stains will help you restore your upholstery, without expensive cleaners. Cleaning sticky things like gum, candy and chocolate all starts with a common household item: ice. Just rub an ice cube over the stain until it becomes hard. Next, use a blunt edge tool like a butter knife to chip the gum or candy off the fabric. 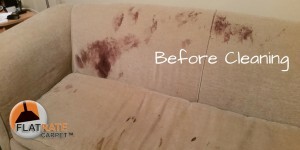 Be gentle on the fabric, scraping too hard will rub in the stain and could scratch your sofa as well. 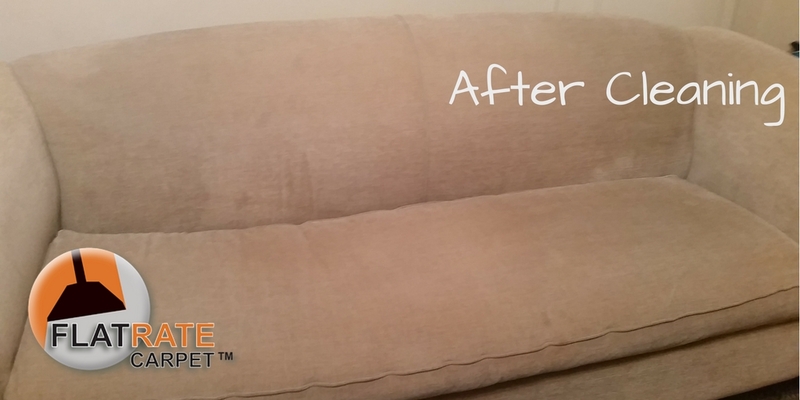 Before using any upholstery cleaner, be sure to test it on a part of the sofa that’s not visible. If the cleaner is safe for your sofa, go ahead and apply a small amount of cleaner to the area with a clean, white rag. Gently blot up the cleaner with a dry, clean, white rag. Continue this process of applying and removing cleaner until all the gum is gone. 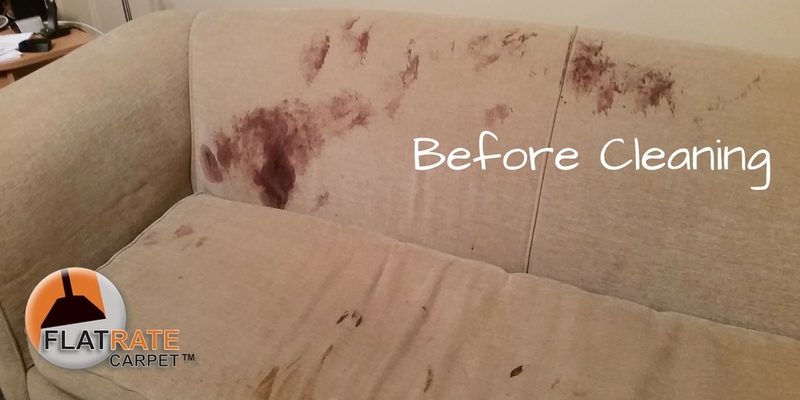 Next time you find a sticky mess on your sofa, don’t despair. Cleaning up is super easy when you know what to do. If you are a female or live with a female, it’s likely that, at some point, you have encountered the nail polish dilemma. The dilemma that steams from the sometimes unavoidable spill or spot that drips onto carpets, rugs and upholstery during at-home, DIY mani/pedi treatments. But have no fear, we’re here to help. Follow these insider tips and remove nail polish from your upholstery easily. First, start by quickly blotting up all the excess polish. Be careful not to rub because it will cause the stain to spread. Using an eye dropper, apply a few small drops of acetone to the polish stain. Blot the stain immediately. Repeat this step until the entire stain has been lifted out of the upholstery. If the stain remains in your upholstery, apply a few drops of hydrogen peroxide, from an eye dropper, directly to the stain.